Missionary Bert Elliot (brother of martyred missionary Jim Elliot) went home to be with Jesus last Friday. 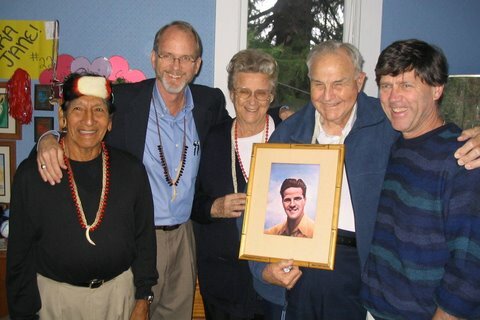 Nanci and I met Bert and his wife Colleen in January 2006, which marked the fiftieth anniversary of the martyrdom of the five missionaries in Ecuador. In our church services I interviewed Steve Saint, son of martyr Nate Saint; Steve McCully, son of martyr Ed McCully; and Mincaye, one of the tribal warriors who killed the missionaries and later came to faith in Christ. Afterward we joined Bert and Colleen and other Elliot family members for dinner at Jim’s childhood home. In 1949, when Bert and Colleen were students at Multnomah Bible College, they were invited to Peru by a missionary. They became missionaries to Peru years before Jim went to Ecuador. When we discussed their ministry, Bert smiled and said, “I can’t wait to get back from furlough.” At that time, they were in their eighties and in their sixtieth year as missionaries, still joyfully reaching people for Christ. Until that weekend I didn’t know anything about them. They may have served Christ faithfully under the radar of the church at large, but not under God’s. In this nine-minute video from my message at the 2007 Desiring God National Conference, I share some thoughts about Bert. Randy Alcorn Speaks About The Unknown Brother of Jim Elliot from Randy Alcorn - EPM on Vimeo. Bert didn’t go on to describe himself, but I will. Unlike his brother Jim, the shooting star, Bert was a faint star that rose night after night, faithfully crossing the same path in the sky, to God’s glory. In missions work, suffering sometimes results in a short life culminating in martyrdom, sometimes in a long life of daily dying to self and living for Christ. I believe Jim Elliot’s reward is considerable, but it wouldn’t surprise me to discover that Bert and Colleen’s will be greater still. “Multitudes that sleep in the dust of the earth will awake: some to everlasting life, others to shame and everlasting contempt. Those who are wise will shine like the brightness of the heavens, and those who lead many to righteousness, like the stars forever and ever” (Dan. 12:2–3, NIV). Bert and Colleen Elliot have lived a long obedience in the same direction. Whether we follow God to leave our country or to stay here, all of us are likewise called to a life of faithful endurance, empowered by Christ.